And so the events here on Tuesday night are difficult to grasp for a town that prides itself on its tranquillity. 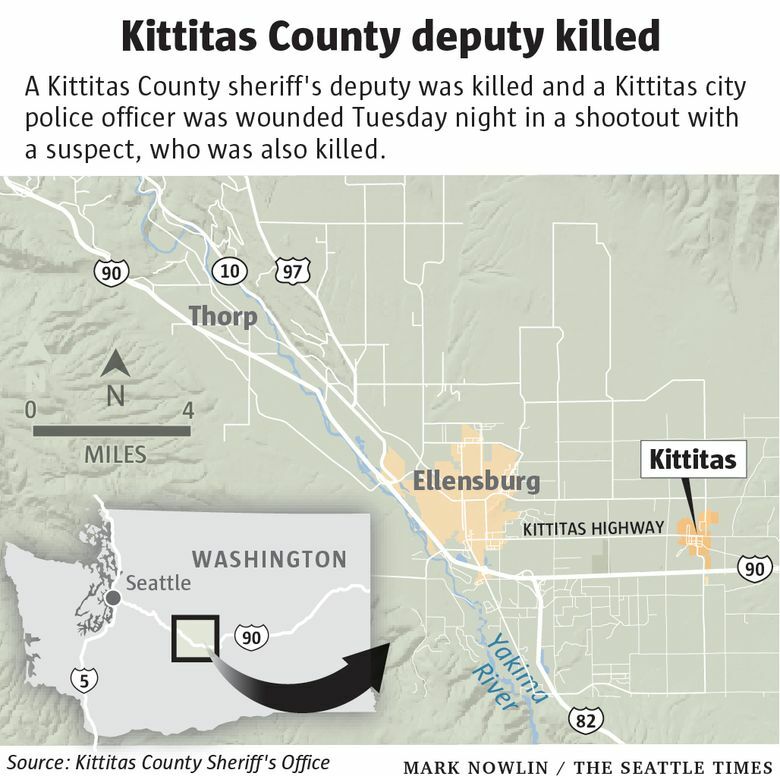 A Kittitas County sheriff’s deputy was shot and killed and a Kittitas city police officer was wounded in a shootout with an armed man. The suspect was also fatally shot. It was the first fatal shooting of a law-enforcement officer in the rural county in 92 years, according to Kittitas County Sheriff Gene Dana. “For this to happen here? It’s insane. You don’t get that here,” said Ethan Keaton, 17, a junior at Ellensburg High School, who stopped by a growing memorial at Kittitas Elementary School, a block from the scene of the deadly shooting. Alongside Keaton was Josh Dunn, 20, who grew up in Kittitas and now works in a warehouse. 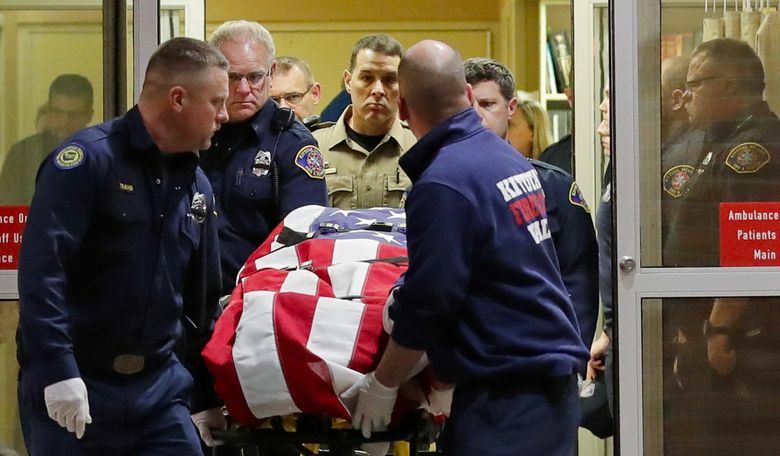 Throughout the day, people arrived at the memorial to honor slain Deputy Ryan Thompson, 42, who was born and raised in Walla Walla and attended Central Washington University, just eight miles from here. He is survived by a wife and three children. Injured in the shootout was Kittitas police Officer Benito Chavez, 22, who was airlifted to Harborview Medical Center in Seattle and listed in satisfactory condition on Wednesday afternoon. Chavez is married and his wife is expecting a child, according to Kittitas law-enforcement officials. The Ellensburg Police Department, which is conducting the investigation at the request of the sheriff’s office, identified the suspect as Juan Manuel Flores Del Toro, 29, of Ellensburg. Dispatchers received a call about 7:30 p.m. Tuesday reporting a man who was driving erratically and displaying “road rage” behavior, police said. Thompson tried to stop the vehicle, but the driver refused and drove into Kittitas, where Chavez joined the chase. The driver turned in to a trailer park around 7:45 p.m. In less than three minutes, the suspect had left the car and fired at Thompson and Chavez, according to the Sheriff’s Office. Irma Serrano lives in one of the mobile homes placed on dirt that rent space for $410 a month. She was in the kitchen. “I heard the shots,” she said. She looked outside. “A guy was shot in the leg. He was screaming,” she said, likely referring to Chavez, who officials said suffered a shattered femur. Then, sirens. More cops. Medics. 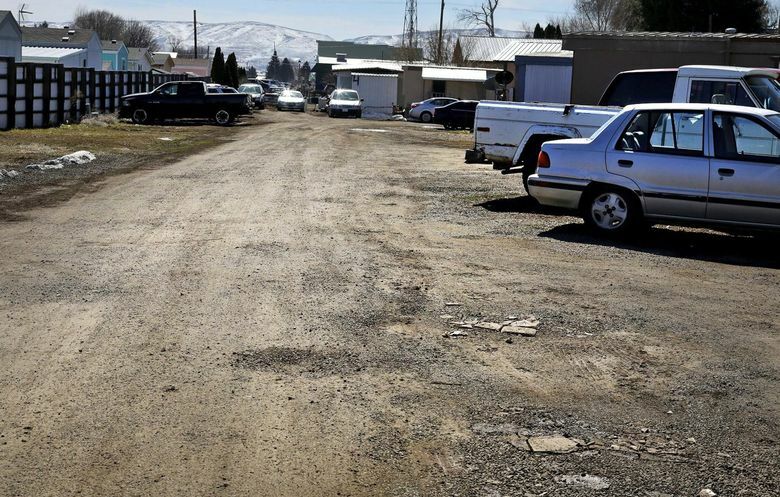 Kittitas is a modest town. The police force consists of the chief and two officers, which is why sheriff’s deputies help out. As you pull off Interstate 90, there are the common sights of little towns. The lone gas station. The rows of rental storage places. A “For Lease” sign on a corner commercial building. A church. This being an agricultural area, signs by a warehouse stating, “These potatoes are grown for Tim’s Cascade Style Potato Chips.” Two blocks that include a grocery store, tavern and barber shop. This is a place where you can still buy a three-bedroom, two-bathroom house for $210,000. Liz Smith is one of the city’s council members. Ten years ago, she and her husband moved here from Alaska. Then there was the shootout. “I feel very sad. I don’t want this to become how people think of Kittitas. There are a thousand of beautiful moments in this community,” said Smith. Dana, the Kittitas County sheriff, called Tuesday his “worst day in 45 years” of law enforcement. Dana said Thompson first joined the Kittitas County Sheriff’s Office in 2004 as a reserve officer. 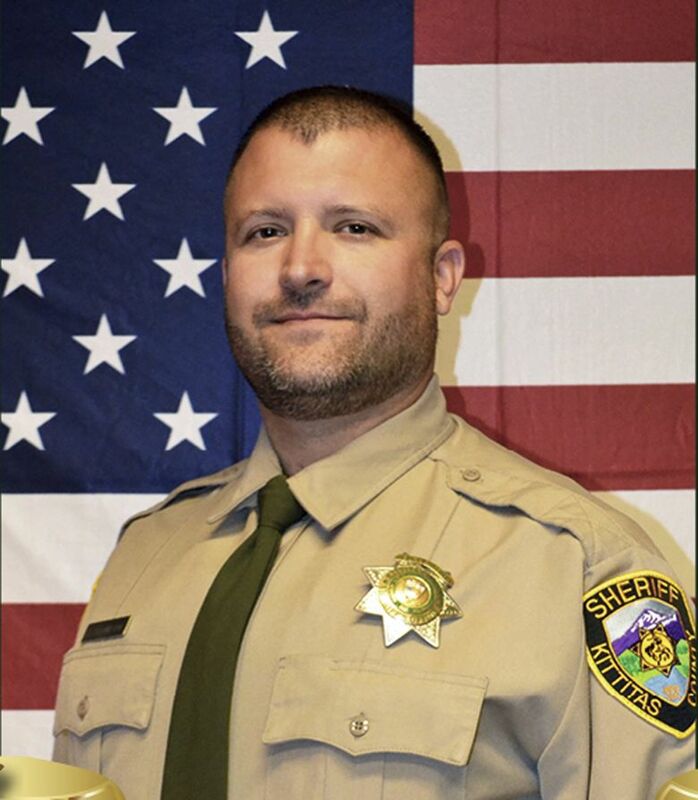 He then worked stints as a corrections officer and a police officer at his alma mater before returning to the Sheriff’s Office full time in 2013. At the chain-link fence outside Kittitas Elementary, the locals kept stopping by. 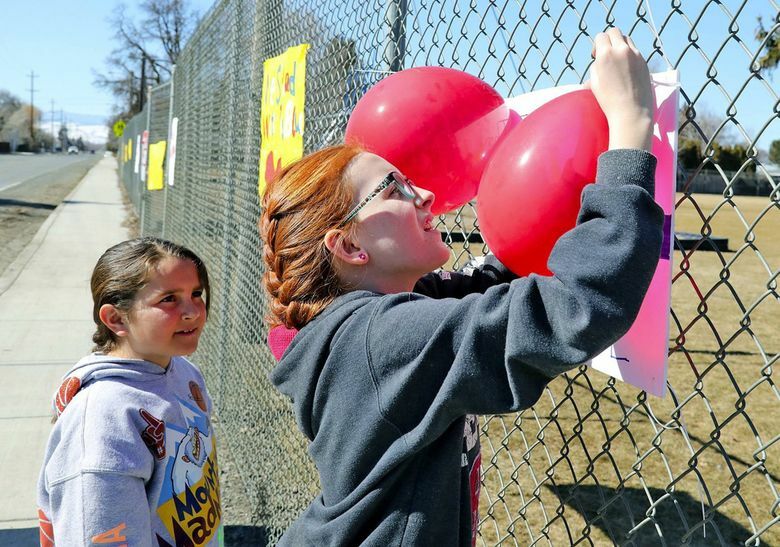 Sharon Armengol walked over a block with her granddaughters, Summer Armengol, 12, and Lily Parker, 8. On Tuesday night, she heard a gunshot, but didn’t think anything of it. “We have a lot of cougar sightings here,” she said. Then her son called with the news of the shootout. On Wednesday, she stopped by the school with her two granddaughters and their own homemade memorial. It said, “Thank you for your service,” with the girls copying the image currently on the sheriff’s Facebook page. It is of a deputy’s badge with a black ribbon across it. Seattle Times staff reporter Christine Clarridge and news researcher Miyoko Wolf contributed to this story.